You are currently browsing the archives for the MOOCs category. 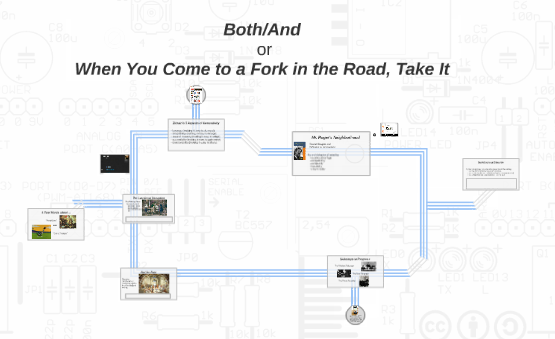 This is a version of the keynote talk I gave at City Tech’s Tech Day (3/18/15). Preamble (Don’t start the Prezi, linked to the image, just yet). I want to give just a little personal context, since it’s always good for people to know why you’re saying what you’re saying. Because I’m on LinkedIn, I had this weird experience as we hit 2015 – people wrote to congratulate me on the 15 years I’ve been overseeing Academic/Instructional Tech. That’s an insanely long time to be in a job like that, when you think of all that’s changed. But time does tell. (As Emerson said, the years teach much that the days never know.) Looking at reviews of recent publications — The End of College, for instance – I had this sense of déjà vu and went and pulled down The Social Life of Information (2000). Taking on the misguided prophecies of the nineties, it starts by saying that “the rise of the information age has brought about a good deal of ‘endism’” (16). So I want to say a little (more) to counter all the hype and hysteria about what technology will do to higher education as we know it, partly because we’ve been through this before. OK. If you click on the image, you can follow along, advancing the presentation every time you see an underlined heading. Revolutions/Game Changers – It seems lots of people talking about technology want to say that one thing or another is going result in a revolution or be a game changer. Such claims are so common we may fail to realize how rarely they’re true, Or maybe, which is at least as likely, we sense the terms themselves are abused and overused. Revolutions are dramatic changes — changes so dramatic they beg comparison to the violent overthrow of rulers by those they rule. Games, being highly rule-bound and regulated, change rarely because they necessarily change by a rewriting of the rules. Neither “revolution” nor “game-changer” seems to describe the changes that are essentially, at least according to Clayton Christensen, disruptions by outside forces or events or (especially) technologies. We are likely to get further with relevant examples and precedents than such fuzzy terms. The Last Great Disruption – The past gives us a great point of comparison in the invention of the printing press and what ensued. It was both more and less radically transformative than it figures in the popular mind. We tend to forget that the ability to print books may actually be more easily and quickly effected than the widespread ability to read them — something, frankly, we are still working on. People at the advent of such changes are even less affected in seeing how they’ll play out. This is especially true of those who feel threatened by such change. They picture the consequences for themselves that may or may not come to pass. The professors of the day were a case in point. They did feel threatened. They had access to texts, much fewer in number before than after the printing press intervened, and they imagined they would be less important or necessary because they saw their role largely as saying to their students what they texts said to them. As it turned out, saying what they books said was not the heart of teaching, or at least what teaching would become. That, instead, would lie in interpretations, applications, and extensions of understandings that would evolve over time, and widely accessible books, far from replacing teachers, would instead give them a starting point to do much more than say what was said. Again, this took a long time. The real effect of the printing press on higher ed and the world at large required a vast growth in literacy and all the social and cultural and economic changes that would bring. Sidesteps to Progress — It’s not just that technological innovations take time to overcome resistance and reach their potential. They are often not used as they were expected (even intended) to be used. The history of technology is a series of such stories. One example is how the epochal change in communication that telegraph amounted to and how all (from our perspective) equally epochal changes that followed — the radio, the telephone, the phonograph — were conceived of in terms of the initial guise of extensions of an invention they diverged radically from (and in some cases supplanted in the process). Example of SMS – Again it’s not just the technology, but the use-niches it falls into and flows out of. To get a sense of all that is behind the reasons for texting, check out danah boyd’s It’s Complicated: the Social Lives of Networked Teens. Both/And, not Either/Or – So we accommodate the new, arrange it on our landscape of options till the landscape itself is changed, and the (smart)phone leads to the erasure of the public phone. The point is that things do change, and dramatically, and faster than ever before because change has accelerated to the point that what has changed is change itself, becoming the expectation and the rule, not the disruption of that. I just mentioned the iPhone. It’s been with us less than a decade; we already can’t imagine life without being constantly accompanied by this thing that is our newsstand, entertainment center, library, game collection, camera — and, oh yes, phone. It’s not just public phone booths that have disappeared. What has happened to video stores, encyclopedias, half of our newspapers? If we take the long view in higher ed, how do we make the right bets? Mr Rogers can help, ER and his Diffusion of Innovation, running through five editions and giving us the term “early adopter”, particularly his 5 attributes of innovations, and how they bear on our work – relative advantage (almost never cost initially, but the ability to do something better, is hard for educators to see, validate, and inculcate — because we don’t teach people how to teach in higher ed), compatibility (out-of-the-box doesn’t fit in our box), complexity (enough said), observability and trialability (a problem, teaching being oddly closeted). MOOCs amount to the exception that proved the rule — very observable and trialable (but that was part of the problem). The Massive Open Online Course was supposed to be the killer app for higher ed, our revolution and tsunami, but was a failure even (especially?) when free because at its heart it was the opposite of something new: a shopworn pedagogy, and an egregious scaling up of the large lecture class. Attempts to make it work turned out to be less massive, or open, or online, or even course-like – now absorbed into the landscape as a fringe element, useful for certain kinds of blending (the flipped MOOC), executive ed, and life-long learning. Note how, being old at heart, it was swallowed up by the already-there. Apparently we had to learn again what the printing press should have taught us half a millenium ago: transmission is not education. The OpenLab : The best example of generativity I can think of. It’s a vast and vastly successful example of information made into knowledge and knowledge made visible. That was the whole point of The Social Life of Information: for information truly to inform (and not be inert data), for it to be transmuted into knowledge, it has to be socialized, applied through sharing and collaboration, built up mentoring and community building. That’s exactly what the City Tech’s OpenLab is and does, and it’s glorious. One last slide: My contact info, in case you want to get back to me on any of this. Be careful what you wish for. Started back in 2009, this blog on academic technologies was hijacked in 2012 (“the Year of the MOOC“) by MOOCs. I felt so compelled to blog about these hyper-hyped (then much transmogrified) Massive Open Online Courses (getting less massive, less open, less fully online, and less course-like all the time) that, after one or two retrospectives, I’m sort of at a loss when it comes to what to blog about these days, now that the once mighty MOOC zeppelin seems a deflated blimp. Not that I couldn’t find plenty to say about ed tech and online learning and so on BM (Before MOOCs). So I’ve decided to do a combination update/valedictory and move on. At least for the nonce. And this is what the advocates are saying. Meanwhile, some highly placed people are raining on the parade already past. Hillary Clinton, speaking at the Globalization of Higher Education conference earlier this week in Dallas, did not criticize MOOCs and online learning specifically, but she did (as cited in Inside Higher Ed) say there’s “no substitute for the kind of learning that takes place in a well-taught classroom,” and that “technology is a tool, not a teacher.” And former fellow Cabinet member, now UC President Janet Napolitano, “joins skeptics over online courses” (as Monday’s Reuter headline had it), specifically those big productions that are supposed to handle more students at a lower cost: “There’s a developing consensus that online learning is a tool for the toolbox, but it’s harder than it looks and if you do it right, it doesn’t save all that much money,” she said about the prospect of cheap online courses that might let California educate more students for less money. So are MOOCs just a blip? Given not just the attention but the investment afforded MOOCs, you would expect some resilience to them. But where will they flow, like water blocked in one channel but not another? Some sense of an answer may be in the very critiques and declarations of failure. The low completion rates are notorious, even in the popular press, and not least of all in the Times, which fed so much of the original hoopla with pundits like Brooks and Friedman and big spreads like the one on “the Year of the MOOC“; but in another sense the limits of their wide reach was a sign that being big didn’t mean reaching (and especially working for) everyone. As the potential retracted, it essentially redefined the logical market: the successful students for MOOCs were those who were already college educated, and this was especially true of MOOCs that had that touted global reach. So MOOCs will fill the interstices, and not the ones that most need filling. But we shouldn’t confuse the evolving business model with the lessons MOOCs have taught: that teaching (and its reach) can scale dramatically, that new modes and media make for new possibilities, that what might not succeed as a standalone may work well and complement or supplement. Cathy Davidson’s recent MOOC (to a considerable extent a MOOC on MOOCs) pulled out all the stops to show what a rich trove of possibilities that is, with layered readings, guest lectures, local as well as online discussion groups, multiple tiers of participation and evaluation. Even in this form (or array of forms), and pace Clinton and Napolitano, online learning is not just a (singular) technology or just a (singular) tool but a huge bag of tricks we’ve only begun to learn how to play with. Posted by George Otte Comments Off on MOOCs: Flame out or Flame on? Comments Off on MOOCs: Flame out or Flame on? Critics of massive online courses seized on this latest article, along with a recent profile in Fast Company magazine of one of the biggest proponents of MOOCs, Sebastian Thrun of Udacity—where he called the courses “a lousy product”—as evidence that 2014 will be the year when higher education returns to reality and all this talk of disruption finally ends. Uh. OK. Nice to hear. And when were we not living in such a moment? I would not want suggest that there is nothing to learn from all the Sturm und Drang, or not much more than that a lot of the pasta thrown at the wall slides off — though even that is a lesson worth learning. But I think a more important lesson for journalists (and ex-journalists) to consider is that university administrators and faculty don’t make there best decisions with a gun to their heads. And they work better when they’re looking at evidence and data, not touted potential. The not so simple fact is that higher education in the US (or anywhere, but especially the US) is a incredibly stratified and complex unsystematic system. People who say they’ve seen the future or know what the next big thing is should acknowledge that, even if they’ve seen something work somewhere (and many didn’t wait for that, of course), what works for some in some place is not going to change (or end) the world. The real lesson to be learned here is the opposite of hubris: have a little humility in the face of complexity. 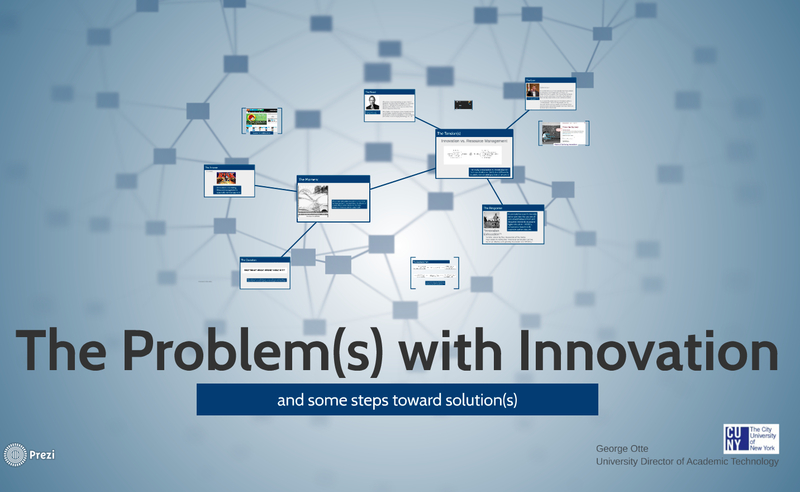 Posted by George Otte Comments Off on Feeling Disrupted? Comments Off on Feeling Disrupted? After a year of ever-heightening hype, this was the year of stepping back from MOOCs, and sometimes running away. It began with expressions of faculty resistance, but the tide really turned with data about results. Now there’s a trend to pile-on, to declare the whole MOOC phenomenon a mistake, a failure –and that’s likely to be at least as premature as the early hype. Whatever happens at San Jose, even the loudest critics of MOOCs do not expect them to fade away. More likely, they will morph into many different shapes: Already, San Jose State is getting good results using videos from edX, a nonprofit MOOC venture, to supplement some classroom sessions, and edX is producing videos to use in some high school Advanced Placement classes. And Coursera, the largest MOOC company, is experimenting with using its courses, along with a facilitator, in small discussion classes at some United States consulates. Talk about the morphing and multiplicity of MOOCs is not new — as long ago as April of this year Ron Legon was talking about looking beyond the monocultural “MOOC 1.0” to a more nuanced and polymorphous MOOC 2.0. Now that we have some public recognition of the need to look that way, it will be interesting to see what will be tried — and supported — next. We know connection and communication and content can scale. TV taught us that. Now what might we learn about real teaching and learning? 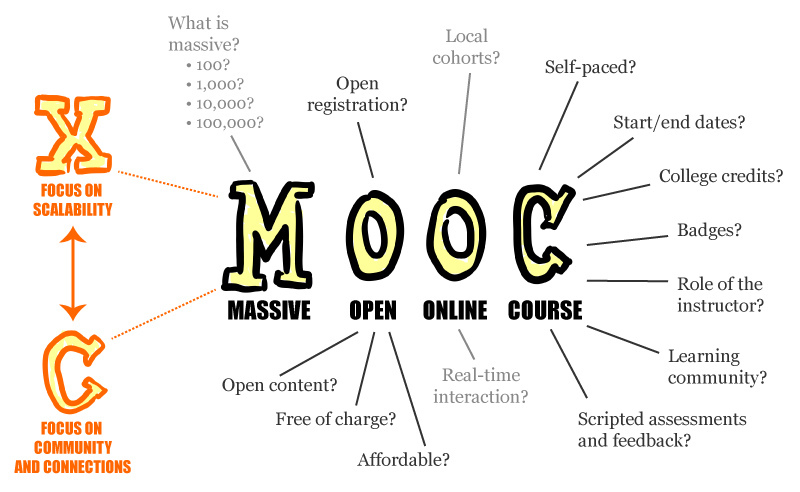 The story of MOOCs is not a single story. Once touted as higher ed’s own singularity, there’s nothing singular about MOOCs any more. They come in all sorts of shapes and sizes, openness and course-ness. And the point that they’re all over the place (in all senses) has been made ad infinitum. So why do we feel like we’re going around in circles about whether they’re a good thing or a bad thing (as if they were one thing)? Some of this is the familiar pattern of action and reaction, so regular it has begun to feel like the tick tock of a pendulum. My last blog post — “Skepticism Abounds” — took its title from a report on a survey of faculty and administrators regarding online learning generally and MOOCs in particular. The same day, in the same source for that report (Inside Higher Ed), came a piece from the president of the American Council on Education (ACE) meant to be reassuring. Titled “Beyond the Skepticism,” it noted that there were indeed reasons to be skeptical, that “it hasn’t taken long in many quarters of our community for acclaim to accede to skepticism, and excitement about MOOCs to fade amid charges of excessive hype.” But not to worry: ACE will vet these MOOCs and decide which are worthy of credit. No sense here that faculty might be skeptical about that independent vetting — certainly independent of said faculty. That’s painting with a broad brush, but that’s done equally artfully by both sides. A defender of MOOCs, James G. Mazoue, promises to explode the “myths” about MOOCs in the latest EDUCAUSE Review, but as a counter-argument it’s really my-straw-man-meets-your-straw-man. The “myths,” framed as statements like “It’s All About Money” or “MOOCs Are Inherently Inferior,” are phrased as the kind of absolutes we’d know to mark False on a True-False test even if we knew nothing about the subject. Of course there exceptions to those statements, we think. In fact the real problem is that most MOOCs are themselves exceptions, one-offs and stand-alones, not curricula or integrated parts of a larger plan. Go ahead, just try to generalize about them. Or even try to frame expectations about them. Wait… Could that be a problem? Could that, right now, be the problem? Faculty members understandably fear job losses, as Professor Albert J. Sumell, at Youngstown State University, cogently and sympathetically explains in an article aptly titled “I Don’t Want to Be Mooc’d.” Although there are ways of minimizing such risks of job loss (e.g., by redeploying faculty to higher-value tasks and by teaching more students), we have to be prepared to contemplate shifts in faculty ranks—both in overall numbers and in composition. We also have to recognize the implications of such possible changes for graduate education and for what is called “departmental research.” John Hennessy, at Stanford University, is one of the few leaders in higher education willing to be brutally candid in talking about such subjects. The plain fact is that a combination of fiscal and political realities will continue to put inexorable pressure on the economic structure of higher education in the United States, especially in the public sector. Although an intelligent reexamination of tuition policies and financial aid policies can be of some help, I do not think there is any way to avoid thoroughgoing efforts to raise productivity—both by reducing the “inputs” denominator of the productivity ratio and by raising the “outputs” numerator. Bowen really does explain something here: why the discussion of MOOCs and alternative modes is getting such attention — not least of all from administrators — even without solid successes or a proven business model. (Speaking of sustainability, giving it away is not a long-term option either, as everyone knows.) Costs are exceeding the power of institutions to control or students to bear. Change is already happening, in other words, and it is carrying away treasured ideas of equity and mobility. As the New York Times pointed out earlier this year, important studies are documenting the extent to which the educational gaps between the rich and poor are worsening, widening. MOOCs, especially in their current state — where so often the “sage on the stage” just becomes the “doc on the laptop,” as Cathy Davidson puts it — aren’t yet a fix, much less a cure-all. But they might be a crack in the wall. And the choice is not the false dichotomy between accepting or resisting change; the best choice, the third path, might be resolving to give it the right direction. It’s important not to exaggerate the extent to which exaggerations miss the mark. There has been real growth of MOOCs in a fairly short time. (An interesting illustration is an interactive MOOC map showing which MOOC providers got traction where and when — all over a time span of not too much more than a single year.) That growth notwithstanding, something has changed, and it’s sort of a good news/bad news situation. The good news is a checking of external pressure that seemed to promise the outsourcing or corporatization of higher ed. The most famous/notorious instance was a proposed bill in California, SB 520, which would have legislatively required the acceptance of MOOCs for credit accumulation and progress toward the degree. After blowback from faculty unions and faculty generally, the bill has been shelved. Fear and faculty backlash focused on much beyond that bill, of course, and there have been other instances of stepping back and standing down, notably action by accreditation agencies not to accept outsourced online instruction. … Steinberg is waiting to see the results of new online efforts by the state’s three public higher ed systems – the California Community Colleges, California State University and the University of California. The public college systems are working to expand their online offerings internally and without outsourcing their students to ed tech start-ups with little to no track record offering for-credit courses. Similarly, the call for a serious look at MOOCs and the like seems to be coming increasingly from within rather than without, if more from the top brass than the grass roots. These expressions of interest are cautious but also committed. The title of a commentary on MOOCs that Michael M. Crow, president of Arizona State, did in a recent issue of Nature, is to-the-point: “Look, Then Leap.” And then there’s this title of an article provoked by a recent memo: “Get Used to Sharing Digital Content, Says U. of Texas at Austin President.” What effect such directives from on high will have on resistant faculty remains to be seen. The rhetoric about and around MOOCs seems to have moved to a new place in the past week or so — with the obvious but still necessary proviso that the term “MOOCs” is less and less about what it stands for [Massive Open Online Courses], more and more a kind of shorthand for disruptive innovation in higher education. As such, the term almost always appears in the plural, connoting not one thing but a variety of flavors, many of which are not, in fact, massive, or open, or entirely online, or even courses in a standard, stand-alone sense. That article likens the trending perception of MOOCs to certain points in a Gartner hype cycle — going from from a “peak of inflated expectations” to a “trough of disillusionment” — and a lot of that also has to do with practical, economic considerations: the failure of a viable, sustainable business model to emerge, the fact that, for all the hype, there’s very little market penetration, the recent survey showing that just 4% of the American public had any real familiarity with MOOCs. That bright and shining “maybe” may be behind the reason that, as Forbes noted yesterday, Coursera has another $43 million in venture capital. It could also be why foreign competitors to the likes of Coursera are emerging, as the Chronicle noted at the end of last week. There’s lots of investment in something that has yet to show return on investment. And though investors have sometimes been wrong, even spectacularly, it’s fair to suppose there’s some serious thinking behind this flow of funding and activity. graduate students pursuing a career in academia typically get limited formal guidance on general teaching skills, let alone tutorials on emerging technologies to digitally enhance their classrooms. On most campuses, there is simply too little opportunity and incentive for junior or senior faculty to lead the charge on pedagogical experimentation. Too true. And it is surely one great reason why, in this particular case as well as generally, disruptive innovation tends to come from the outside. Greenstein is right — higher ed’s reaction to all the MOOC hype is “innovation exhaustion.” But the exhaustion comes not from actual innovation, just from hearing about it so much. In the current near-vacuum of transformative change, innovation itself will likely largely continue to come from forces outside (or at best on the fringes), even if their outsiderhood is held against them.